My grid “Pathlandia” is currently using Diva Canto’s Diva Standalone software [OpenSim 0.9.0.0 Release, Diva release], and I use Ener Hax’s SimonaStick for a simple database solution. Pathlandia Grid has just one region (named Pathlandia), but I upgraded it to a 768m x 768m varregion so it’s as large as 9 conventional 256m x 256m regions laid out in a square (3 regions x 3 regions). Visitors are always welcome! There are many freely copyable curios and curiosities on the island, so please take copies of anything that catches your eye. Enable Lightshare in your viewer when visiting to get the full effect of Pathlandia’s customized sky settings. Looking out at the horizon. To see who’s been visiting Pathlandia, I use Maria Korolov’s script that automatically enters visitor information in a Google Spreadsheet. Here are my Visitor Logs. Click on the old telephone on the outside of my cabin to leave me a message! For an overview, see OpenSimulator.org’s Hypergrid Wiki Page or Hypergrid: Architecture and Protocol for Virtual World Interoperability. For a more technical overview for implementers and programmers, see The Hypergrid Reference Guide. 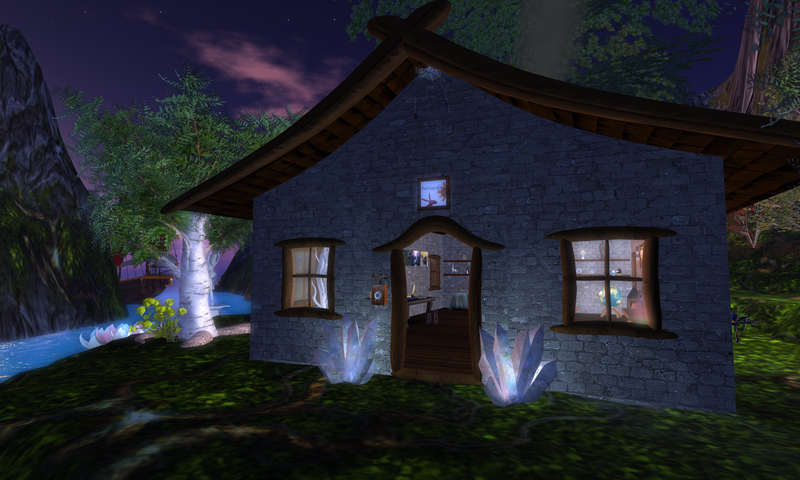 For a great summary of the history of the Hypergrid and how it is evolving, read “Towards HG 2.0″ by Diva Canto (the inventor of the Hypergrid protocol). How to make a Manual Hypergrid Jump in 3 easy steps. Just open your World Map in your viewer (I recommend the Firestorm viewer). 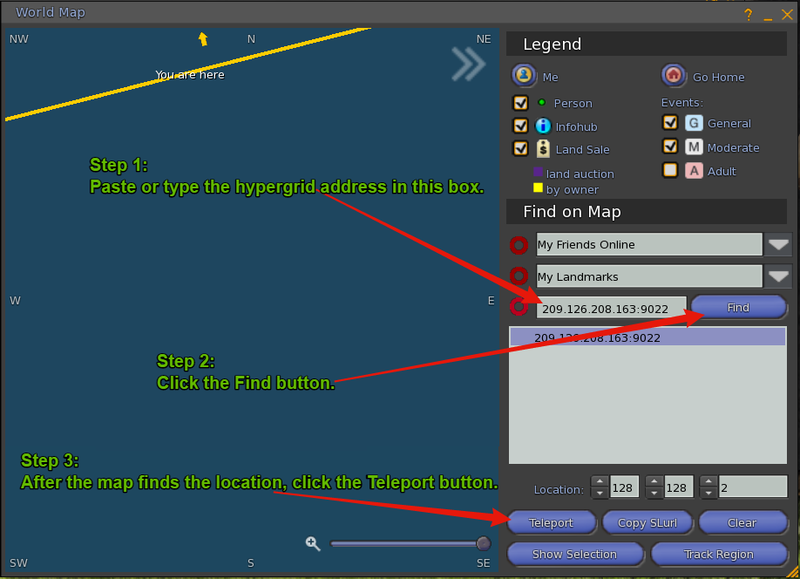 In the text box next to the Search button, enter the Hypergrid Address you want to visit. 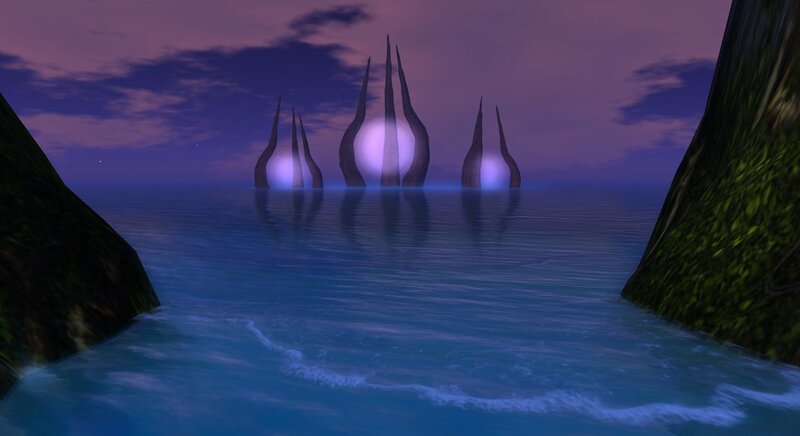 If you’re completely new to the Hypergrid and Opensim and want to visit Pathlandia Grid, I suggest you sign up for an account on OSGrid using this signup page. 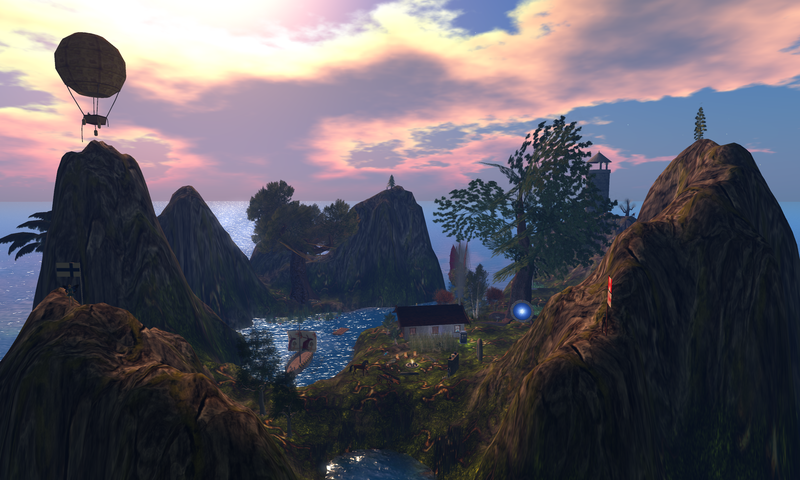 After you have created your account, follow the instructions to log in to OSGrid (I recommend using the Firestorm viewer) and then make a Hypergrid Jump to Pathlandia. If you want to learn more about the hypergrid and discover other interesting grids, you should definitely check out the Hypergrid Safari group. It’s always more fun to explore and learn with helpful friends! Where I monitor Pathlandia (in the real world in Montreal). UPDATE Feb 8 2017: The Hypergrid Safari visited for about an hour today. Here’s a video of the event. 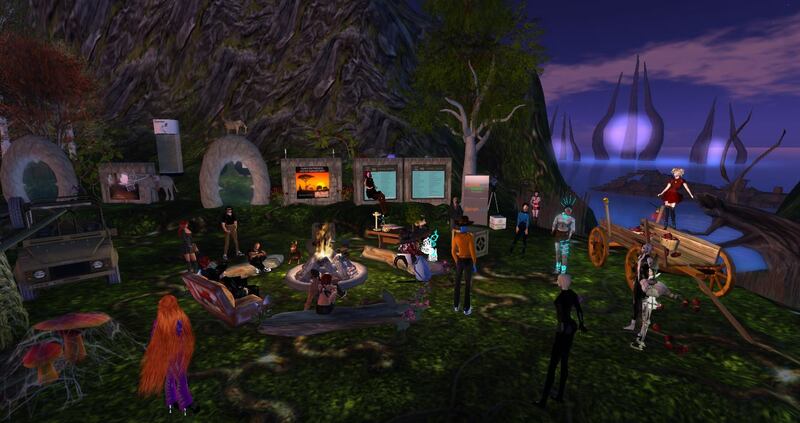 UPDATE Aug 5 2015: Another fun visit by 30 explorers from the Hypergrid Safari. UPDATE Aug 13 2014: The Hypergrid Safari visited Pathlanda today. Here’s a great writeup of the event from Thirza Ember. 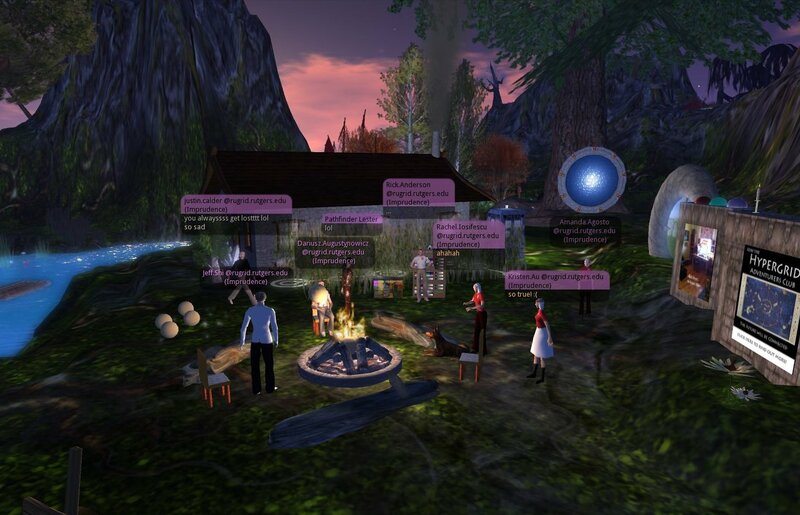 The Hypergrid Safari group having a campfire chat on Pathlandia. UPDATE Jan 27 2012: Rick Anderson, Director of Virtual Worlds at Rutger’s Center for Online & Hybrid Learning and Instructional Technology, brought a group of 10 students to visit Pathlandia last night. I’m happy to report that my grid handled the load perfectly! This entry was posted in Announcements, Avatars, Education, Hypergrid Adventurers Club, OpenSim, Virtual Worlds and tagged avatars, diva, HyperGate, HyperGrid, Hypergrid Adventurers Club, metaverse, online communities, OpenSim, opensimulator, pathlandia, ReactionGrid, virtual worlds by John "Pathfinder" Lester. Bookmark the permalink. I love your office picture. For me, it’s overlaid with my first meeting with you, in your LindenLab office in SL, in 2006. I miss that strange little guy and all his clocks and odd tchotchkes. Hello,me ( smokey Putzo) and Rosie visited your sim tonight(09/01/2014)It was great.We emjoyed ourselves and did copy a few things.Thanks for making it available.We live on The Great Canadian Grid but do enjoy hoppin around.May I mention here we are on a quest to find 2 tiny avs.We did find foxes but would like a more finished type of avatar.Thanks again.Do visit The Great Canadian Grid sometime.Thanks a bunch.Smokey an Rosie. Cool,It is just getting going but it is a great grid,Did you get my email about the tiny avatars? Thanks. Hi Smokey. No, I didn’t see your email. Can you resend it to john.e.lester@gmail.com? Thanks!